Greetings, Schlock Fiends, as we take you kicking and screaming back to Nigeria for a second dose of Nigerian or “Nollywood” Godsploitation. Last Christmas we showed you 666: The End Is At Hand, a delirious take on The Omen series by foaming-at-the-mouth evangelists; in the sequel, we're pleased to tell you that the midget Antichrist from 666... is alive, well, still under four foot tall, and drinking, smoking Guinness and whoring his way across Lagos. Did I say midget Antichrist? You'll remember the Son of Satan from the first film, an angry little “kid” in a David Beckham jersey who spends much of his screen time glowering under a polystyrene horn with CGI eyes. 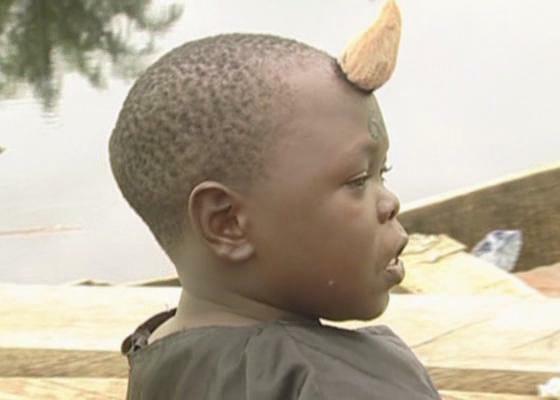 It turns out the junior Antichrist is played by Musa Ibrahim, popularly known as Ibro, a popular midget actor in his early twenties who shot to fame several years ago in a film called Baby Police. While nowhere near the giddying heights of fame reserved for Nollywood midget celebrities Aki and Paw-Paw, this feisty Gary Coleman-in-training has all the hallmarks of a bona fide superstar. Seriously, this little guy has chops: within fifteen minutes he has already garrotted a priest, and at the thirty minute mark he's just sprayed “666” on some comely wench's forehead and is lying back on the bed literally with The Horn. Praise Ibro! At the half-way point the Antichrist upgrades to an adult's body, and the series bids adieu to Ibro while wishing him all the success in his proposed Hollywood career. Antichrist Mark 2 takes on the guise of Pastor Ken, referred to by his congregation as “our Lord”. Part of his ecumenical duties is to dress like a pimp, and to impregnate bored rich housewives (“Praise be to Jesus!”), his Demon Seed thus ensuring a part 3 and 4 - or more accurately, The Signs Of End Time 1 and 2. Are we really that sadistic to play two more of these Nollywood Godsploiters? See you at Easter time, sinners! If this all looks and feels like a home movie or student film, do not be deceived: Nigeria is one of the largest film industries in the world, generating billions from its staggering output of 1000 to 2000 features per year, mostly shot on digital cameras and edited on home computers. Nollywood has its own pantheon of stars, its own international distribution networks, and its own mutant genres (of which the “juju” or religious horror film is just one), all of which operate as if Hollywood doesn't even exist; in Africa they pirate their own movies, and snub the cultural hegemony of Angelina Jolie and company. It's a brazen revolutionary stance, a “DIY Or Die” to the Western Monolith of Media Mediocrity, which Schlock Treatment salutes. I assure you it will take a while to adjust your filmic sensibilities to the Nigerian aesthetic – the accent for one, the shouting of improvised lines, the primitive video production, the computer-generated effects and soundtracks – but like evangelical Christianity, once hooked you're snared forever. 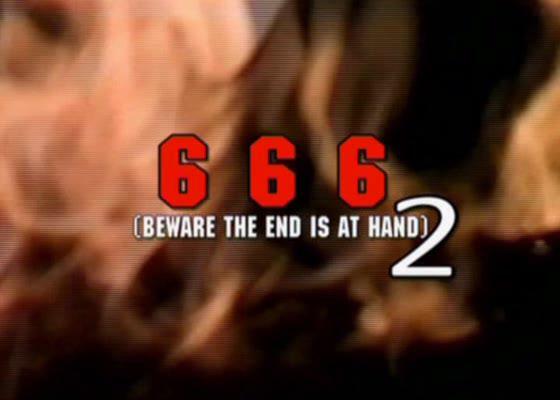 We hope you see the Nollywood Light with 666: The End Is At Hand 2.